As a part of the Step2 Test Drive Mom program, I not only get news on the newest sales and specials from Step2 to share with you, I also get to review some of their great products each year! Earlier this year I reviewed the Step2 My Clubhouse and also the Step2 Wagon for Two Plus. We are still loving both of these items. The My Clubhouse in particular is used on a daily basis by my daughter! This fall I was given the opportunity to review the Step2 Lifestyle Custom Kitchen. We purchased a kitchen set for my daughter for her first birthday, and she just recently received a second kitchen set that we set up at her Grandparent's house. Since my daughter did not need a 3rd kitchen set, I contacted Step2 to see if they would be willing to allow me to give away the Custom Kitchen to one of my readers, rather than receive it for review. I was thrilled when they agreed! I really appreciate all of my loyal readers who read my reviews and enter my giveaways week after week and I'm so excited to be able to offer you another fun giveaway. A BIG thanks to Step2!! 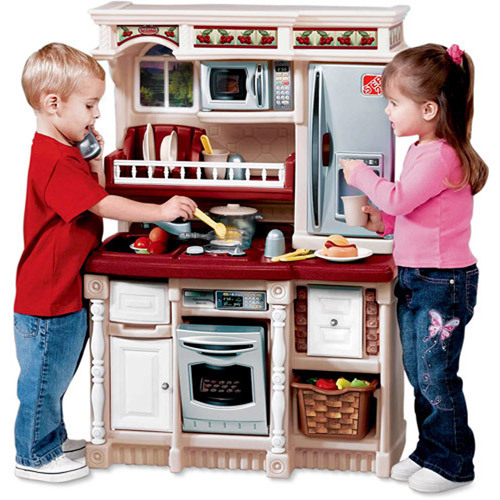 Now kids can role-play being little chefs and learn all about food and fine-dining experiences with this realistic kitchen playset. The Step2 LifeStyle custom kitchen is a compact, upscale kids' kitchen designed to match today's interior home decor. The accurately detailed kitchen play set has plenty of activities and accessories that encourage kids to pretend play in an educational way. The Step2 LifeStyle custom kitchen includes a "stainless steel" oven, a microwave, a refrigerator, a sink with a faucet and a 17-piece accessory set. A special frying pan and boiling pot activate electronic frying and boiling water sounds. The Step2 LifeStyle kitchen furnishes a terrific way for parents or schools to teach kids about food and cooking with one easy play set. This Step2 Lifestyle Custom Kitchen Set is available at Walmart and Walmart.com with a price of just $79.00! If you'd like a chance to win this awesome kitchen set, just fill out the easy Rafflecopter entry form below. Good luck! My son would adore http://www.step2.com/p/Scoot-Slide-Splash-Combo!!! Step2 My Clubhouse would be so much fun for the kids! I like the Sweetheart Playhouse!